Image caption The pledge includes an undertaking "to end the use of unabated coal power"
The UK's political leaders have pledged to work together to combat climate change, whatever the election result. In a joint statement, David Cameron, Ed Miliband and Nick Clegg said climate change was one of the most serious threats facing the world. They said climate change threatens not just the environment but also security, prosperity and poverty eradication. 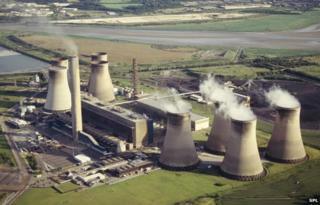 They have promised to end coal burning for power generation in the UK - unless it uses new clean-up technology. Environmentalists say the pledge is significant because it quells some of their fears that the Conservatives might adopt a more climate-sceptic line, to mirror UKIP's position. "It's very unusual to get a moment of unity in the midst of a general election, and it is generating lots of excitement. A non-partisan approach is the holy grail in the US. It is in our national interest to act and to ensure that others act with us." The leaders have gone so far as to promise to ban "unabated" coal-fired power generation - meaning that, if it is to continue, the emissions will need to be captured and stored in rock formations. This decision has been long debated and will send a strong signal of intent to the power industry. The leaders state: "Acting on climate change is an opportunity for the UK to grow a stronger economy more efficient, and more resilient to risks ahead." Critics fear that combating climate change will make energy unaffordable. UKIP says climate change fears are inflated and the party's UKIP's energy spokesman recently said his party wanted to repeal the Climate Change Act, which commits the UK to step-by-step reductions in CO2 until 2050. He said the relationship between CO2 levels and global temperatures is "hugely open to question". Labour leader Ed Miliband recently restated that tackling climate change "goes to the heart of" his beliefs. A Liberal Democrat source said tackling climate change was in the party's DNA. The Green Party says the UK should be making much more urgent progress towards getting the country powered by renewables. "This pledge marks a turning point in the collective effort to take Britain's energy system out of the Victorian age and into the 21st century. Party leaders now need to set a clear expiry date on coal pollution, stop subsidies to coal plants, and start investing in the clean energy infrastructure this country really needs." Industry leaders will need reassuring about how this can be done without pushing up energy prices and making the UK uncompetitive.